If you are expecting a blockbuster soundtrack to 'The Aviator' then think again. Howard Shore has opted for the imaginative use of strings and wind to create a sound picture that is truly a magnificent portrait of the achievements of Howard Hughes. The combination of soaring melodies and the Spanish influences that permeate the score also recreate the atmosphere of California in those heady days of the 1920's. The music contains moments of firm power such as in 'Icarus' and 'Screening Room' with some commentary also inserted for good measure in 'Long Beach Harbour 1947'. 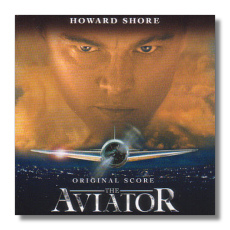 Having just sampled the glories of Vangelis' score for 'Alexander' and Hans Zimmer's similarly ebullient 'King Arthur', Shore's 'The Aviator' came as a slight surprise but it is still highly invigorating and a worthy achievement to match a wonderful film.